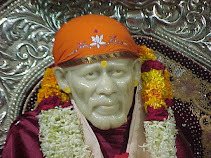 Since last so many days, am simply drawn more towards chanting of the holy name Sai Baba. Had bought a guitar few months back, when i chanted or sung the name Sai Baba along with the guitar, the grace of Baba felt much. The face of Baba in the picture placed in pooja room, looked kind, gentle and beaming with joy. Since than chanting or singing the Name has been a regular part. It is sung for Baba and sung like a spiritual ritual like aarti of Sai Baba, where nothing matters but grace and happiness of Baba. As we read in the sacred scripture Shri Sai SatCharitra, Sai Baba is fond of NaamSmaran (Chanting of Holy or sacred Name). Once i recorded this daily ritual on the computer, and added Baba's pictures to the track. Since it is directly recorded from the computer's inbuilt microphone, the vocal's sound coming through amp speakers did not get recorded properly. It got distorted in the process. Some additional gadget like audio interface is required for clean recording. Still i uploaded a video on youtube. Starngely it gets one new subscriber to my youtube channel every day since then. Not more not less. 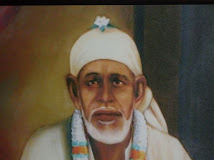 So decided to post this video on this Sai Baba videos blog.